Thanks to National College of Chiropractic, and to the editor of JMPT, Dana Lawrence, D.C. for permission to reproduce this Full-Text article, exclusively at Chiro.Org! BACKGROUND AND OBJECTIVES: Several theories have been put forth in attempts to explain the possible mechanisms by which patients presumed to be suffering from any of a variety of internal organ diseases are occasionally found to respond quickly and dramatically to therapies delivered to purely somatic structures (e.g., spinal manipulation). The purpose of this review is to examine the scientific bases upon which these sorts of clinical phenomena might be interpreted. DATA SOURCES: A review was conducted of over 350 articles that have appeared in the scientific literature over the last 75 years. Initially, a MEDLINE search was performed; however, because of the variability of indexing terms employed by investigators within a wide variety of biomedical disciplines, most of this literature had to be located article by article. DATA SYNTHESIS: At present, there have been no appropriately controlled studies that establish that spinal manipulation or any other form of somatic therapy represents a valid curative strategy for the treatment of any internal organ disease. Furthermore, current scientific knowledge also fails to support the existence of a plausible biological mechanism that could account for a causal segmentally or regionally related "somato-visceral disease" relationship. On the other hand, it has now been firmly established that somatic dysfunction is notorious in its ability to create overt signs and symptoms that can mimic, or simulate (rather than cause), internal organ disease. CONCLUSIONS: The proper differential diagnosis of somatic vs. visceral dysfunction represents a challenge for both the medical and chiropractic physician. The afferent convergence mechanisms, which can create signs and symptoms that are virtually indistinguishable with respect to their somatic vs. visceral etiologies, need to be appreciated by all portal-of-entry health care providers, to insure timely referral of patients to the health specialist appropriate to their condition. Furthermore, it is not unreasonable that this somatic visceral-disease mimicry could very well account for the "cures" of presumed organ disease that have been observed over the years in response to various somatic therapies (e.g., spinal manipulation, acupuncture, Rolfing, Qi Gong, etc.) and may represent a common phenomenon that has led to "holistic" health care claims on the part of such clinical disciplines. One need not be in residence at a chiropractic college for very long before one hears of a patient exhibiting deep radiating pain involving their upper back, chest and arm (symptoms most often associated with cardiac angina) who has experienced significant amelioration of their symptoms immediately following a single upper thoracic or lower cervical spinal adjustment. It certainly comes as no surprise that a number of theories have been put forth over the years in an attempt to explain the possible anatomic or physiological mechanisms by which patients appearing to be suffering from any of a variety of internal organ diseases could respond so quickly and so dramatically to the application of therapies delivered to purely somatic structures (e.g., spinal manipulation). Of course, one possible interpretation of this sort of clinical occurrence (although, as the reader will see shortly, perhaps not the most plausible one) has been based on the notion that primary disorders involving various somatic paraspinal structures must somehow be capable of inducing secondary disorders or diseases involving certain segmentally related visceral organs. If this were the case, therapeutic success in facilitating recovery from such putative, somatically induced visceral conditions would rest rather squarely on the question of whether the somatic intervention employed in these situations was simply effective in removing the culpable somatic influence. On the other hand, regardless of their biological tenability, virtually all of the theories that have dealt with the possible ways in which various aspects of somatic dysfunction might conspire to cause visceral disease have been concocted without benefit of the proper scientific inquiry necessary to establish whether any such causal somato–visceral disease relationships really exist at all. At present, we are aware of not a single appropriately controlled study that has convincingly established that spinal manipulation represents a valid curative strategy for the treatment of any true visceral disease, even though scientlfically unsubstantiated claims of such therapeutic efficacy continue to be all too prevalent throughout the chiropractic profession. Although it is certainly not our intention to dwell endlessly on mistakes of the past, we find it a bit ironic that one of the cornerstones of the so–called chiropractic "philosophy" is that the human organism possesses elegant and powerful mechanisms of self–healing. Of course, this also means that in the uncontrolled clinical setting, the possibilities of natural histories of disease remission, in and of themselves, are more than sufficient to preclude any definitive causal inferences concerning therapeutic effectiveness. Indeed, the perpetual reliance on the anecdotal case report to substantiate the "validity" of chiropractic theory can be more than just a bit troubling, particularly when treatment claims are based on clinical observations involving diseases or disorders known to exhibit exceedingly high rates of natural remission (e.g., otitis media, influenza, infantile colic, Bell's palsy, childhood functional scoliosis, nocturnal enuresis, etc. ), or those characterized by symptomatic histories that are episodic and/or highly idiosyncratic in nature (e.g., multiple sclerosis, bronchial asthma, most allergies, an impressive list of dermatological conditions, herpes zoster, irritable bowel syndromes, essential hypertension, a variety of sleep disorders, and migraine headaches, to name but a few). However, for those who steadfastly promote the view that justification for claims of therapeutic efficacy need only consist of carefully documented clinical case reports and patient testimonials, we merely insist that all patient outcomes simply be considered in a fair and objective manner. In this regard, at least, we might expect an equally intense preoccupation with the generation and promotion of theories that, for instance, might explain the mechanisms by which a given cervical adjustment might have caused the asthma attack that occurred a few minutes later, the myocardial infarction that occurred later that day, the bacterial infection that developed the next afternoon, the auto–immune disease that flared up the next week or the lung tumor that was discovered a month later. Simply put, practitioners of a clinical discipline have adopted the irrational position that valid causal inferences (i.e., claims) can be made solely on the positive clinical outcomes, this discipline would also be obliged, by force of simple logic, to give equal weight to inferences made on the basis of any and all negative clinical outcomes as well. After all, what better reason would there be for a profession to engage in properly controlled basic and clinical research, if not in an ongoing and rigorous attempt to determine whether any of its therapeutic approaches might have the potential to do harm? At the outset, then, it is important to keep in mind that all of the various "somato–visceral disease" models put forth over the past hundred years have essentially represented purely deductive exercises driven rather powerfully and almost exclusively by an enticing repertoire of compelling (albeit uninterpretable) clinical observations. Furthermore, any discipline operating in an environment in which theories are formed solely on the basis of these sorts of uncontrolled clinical observations may tend over time to develop rather "holistic" perspectives in its approach to health care. This might be even more of a temptation if the primary form of therapy employed by that discipline seemed to occasionally provide virtually instantaneous relief of symptoms in patients presumed to be suffering from a surprisingly broad range of otherwise seemingly unrelated visceral disorders. 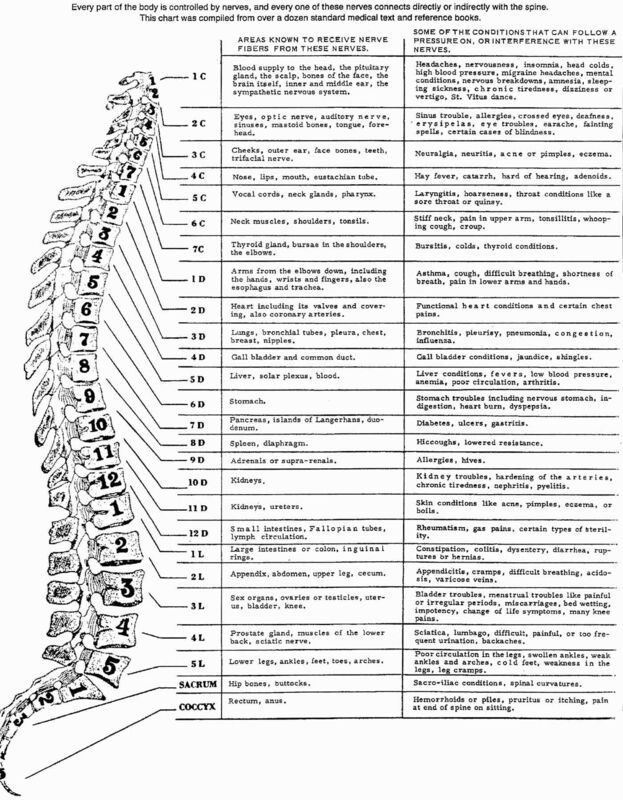 The earliest of the chiropractic "somato–visceral disease" models put forth around the turn of the century, were understandably quite simplistic, considering the relative dearth of scientific information about the human nervous system available at the time. These theories were based on the notion that misaligned (i.e., subluxated) vertebra were capable of compressing both somatomotor and visceromotor nerve fibers as they exited their respective intervertebral foramina (see Figure 1). Schematic depiction of the so–called pinched nerve theory [1, 2], which was put forth around the turn of the century in an attempt to explain the rather immediate amelioration of symptoms sometimes observed in patients presumed to be suffering from internal organ disease, in response to therapies that were delivered to purely somatic structures (e.g., spinal manipulation). Central to this theory was the suggestion that misalignments of the bones of the vertebral column (i.e., "subluxations") were capable of causing encroachment of both somatomotor and visceromotor spinal nerves as they exited their respective intervertebral foramina. It was reasoned that such "nerve interference" then resulted in the pinching off of "vital forces" normally delivered by these nerves to various segmentally related internal organs. Even when stripped of their "vitalistic" elements, such theories are now considered, by most, to be gravely unsatisfactory when confronted by current, well–established scientific concepts regarding human disease and dysfunction in general, the various roles played by both the somatomotor and visceromotor divisions of the peripheral nervous system, as well as the contributions of the vertebral column. The genesis of various presumed "somato–visceral disease" states was then reconciled by the assertion that such "nerve interference" might be expected to interrupt the flow of "vital" forces to innervated organs, thereby leading to their eventual demise [1, 2]. However, even when stripped of their vitalistic elements, such universal "pinched nerve" theories are now considered by most to be so gravely inconsistent with cutting edge concepts and principles of human anatomy and physiology as to be unworthy of any comprehensive discussion here. For example, although many claims are still made concerning visceral disease remission following cervical or lower lumbar spinal "adjustments" (see Figure 2), it has been known for quite some time that cervical and lower lumbar nerve roots do not contain any autonomic axons, not that "interference" with such nerve fibers would be expected to result in the development of true visceral disease, even if they were present (more about that later). Schematic depiction of the rather impressive number of diseases and disorders theoretically presumed to be the result of dysfunction involving various segmentally related somatic paraspinal structures. It is important to point out however that, to date, not a single one of these putative, causal "somato–visceral disease" relationships has been corroborated by results obtained from appropriately controlled scientific investigations. Nor does the hypothetical existence of somato–visceral mechanisms capable of inducing such segmentally–related disorders receive much support at all in light of current scientific knowledge regarding the roles the autonomic nervous system plays in both health and disease. In spite of this, such theories (claims) are still rather dogmatically reinforced by more than just a few chiropractic colleges and by a number of chiropractic continuing education relicensure seminars or may even be found conspicuously displayed in many chiropractors' offices or contained in various patient "education" brochures. Unfortunately, despite the serious lack of scientific credibility, versions of these pinched nerve theories are still occasionally taught, or at least strongly implied, at some chiropractic colleges and at more than just a few post–graduate relicensure seminars or may be found prominently displayed in many chiropractors' offices or included in various patient "education" brochures. In any case, as knowledge concerning the anatomy and physiology of various somatic and autonomic neuronal mechanisms has accumulated in the scientific literature, the rather archaic pinched nerve theories have gradually been abandoned in favor of more modern, reflex–based theories. One of the most often–cited of these reflex–based, somato–visceral disease models was put forth around the middle of the century by Irvin Korr [3–12], working on behalf of the osteopathic profession. Much to Korr's credit, substitution of these reflex-based theories avoided many of the discrepancies (or at least some of the more obvious anatomic ones) imposed by the pinched nerve theories that preceded them. For instance, it was already fully appreciated by then that afferent nociceptive signals arising from various somatic tissue elements, including those associated with the vertebral column, were capable of facilitating the activities of a number of neuronal pools within the central nervous system (e,g" spinal cord and brain stem). It had also been quite well established that these central excitatory states could, in turn, result in a whole host of secondary somatic and autonomic efferent reflex responses [13–20]. The salient features of Korr's model (illustrated in Figure 3), therefore, were based on the central premise that afferent signals transmitted from dysfunctional somatic structures, once having entered the central nervous system, were responsible for generating segmentally specific or regionally specific increases in efferent activity, involving not only those neurons that innervate somatic structures (i.e., somato-somatic reflex responses) but also, more importantly, those neurons that innervate regionally or segmentally related internal organs (i.e., somato-visceral reflexes). Of course, whether both somato-somatic and somato-visceral reflex responses occur in reaction to somatic pain is really not at issue. However, Korr chose to extend his theory rather significantly to include the notion that if such visceral efferent responses did occur, they might be expected to create unfavorable situations (i.e., maladaptations) in various innervated organ tissues, thereby ultimately leading to processes of frank tissue disease [3–12]. 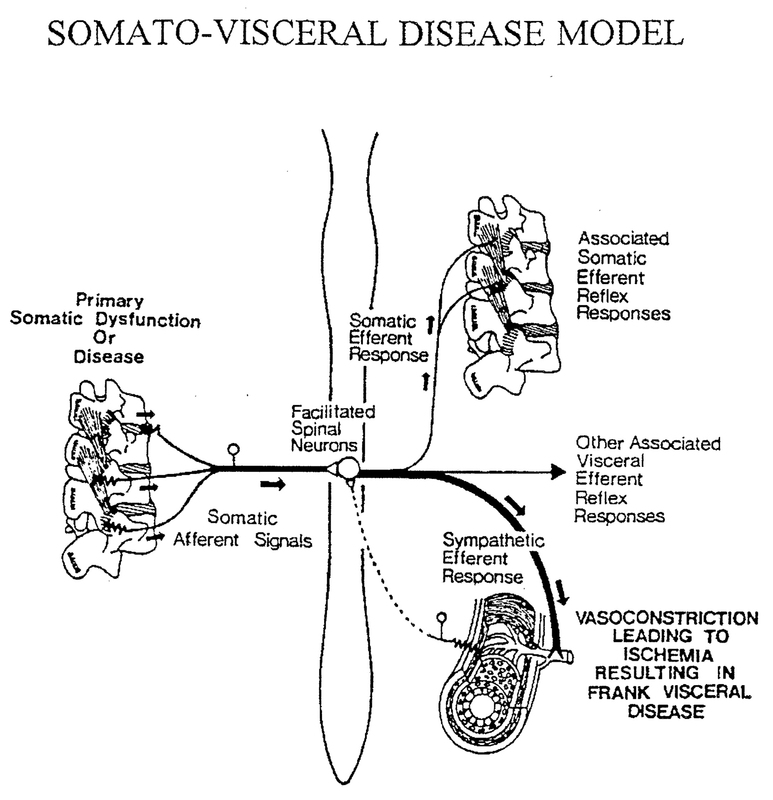 Schematic representation of the theoretic reflex-based "somatovisceral disease" model put forth by Korr and others around the middle of the century [3–12]. This theory maintained that afferent nociceptive signals generated by dysfunction involving various paraspinal somatic structures, once having arrived in the central nervous system, then acted to facilitate the activities of segmentally related somatomotor as well as visceromotor (autonomic) neuronal cell bodies. These reflex-induced increases in autonomic activity, particularly that of the sympathetic division, were then postulated to induce pathophysiologic vasoconstriction responses in their respective segmentally-correlated internal organs. The states of ischemia thought to be produced by this somato-visceral "vasoconstrictor attack" were then presumed to lead to the eventual demise of any organs which might be susceptible to them. Admittedly, such reflex-based theories certainly represented a substantial improvement over the "pinched nerve" notions which preceded them (See Figure 1). However, since that time, major scientific advances regarding the roles that the autonomic nervous system is now known to play in both health and disease have made the existence of a segmentally-related "somato-visceral disease" mechanism far less tenable than it might have seemed when Korr and others first envisioned it more than fifty years ago. For example, a view commonly held at that time was that sympathetically mediated vasoconstrictor mechanisms operative in various emergency situations and during exercise simply served the purpose of reducing blood flow to certain tissues (skin, gut), thereby "shunting" blood to others (brain, heart, skeletal muscle). Although this might have seemed to make a modicum of sense, it is a very oversimplified and therefore highly misleading representation of the true role of the sympathetic vasomotor system in this regard. On the other hand, given that theories and models are generally only as sound as the knowledge base upon which they are contrived, it might have seemed that such vasoconstrictive effects might actually be capable of causing clinically significant compromises in blood flow to segmentally related organs. The presumed oxygen and nutrient deprivation in such affected tissues might then have been expected to render them susceptible to a host of damaging influences, thus theoretically providing for the illusory "somato-visceral disease" connection. The apparent effectiveness of spinal manipulation in patients presumed to be harboring such somatically induced, sympathetically mediated, ischemia-producing, visceral disease states could again be interpreted as a simple manifestation of the therapeutic removal of some culpable, disease-producing, somato-visceral reflex influence. Unfortunately, even reflex-based models such as the one put forth by Korr and others, although certainly far more tenable than the pinched-nerve theories that preceded them, have not held up at all under the weight of current scientific evidence. Since that time, a truly impressive body of scientific information has accumulated with regard to the anatomic and functional relationships that exist between various autonomic nerves and the tissues they innervate. This has resulted in tremendous advances in the understanding of the roles the autonomic nervous system plays in both health and disease. However, these newfound insights, including those concerning various somato-visceral reflex components, have made the theory of segmentally related, somatically induced, internal organ disease far less plausible than it might have seemed when Korr and others first envisioned it more than 50 years ago. Therefore, perhaps the basic premise of a segmentally or regionally related "somato-visceral disease" mechanism deserves some thoughtful reevaluation. Before embarking on a more in-depth discussion of the various assumptions implied by these theories, it is worth noting that the limited amount of hard experimental evidence put forth by Korr et al. [21–30] in support of the existence of a regionally or segmentally related "somata-visceral disease" mechanism was based primarily on the examination of sympathetic reflex responses involving otherwise somatic structures (i.e., cutaneous sudomotor and vasomotor effects). Such reflexes, although sympathetically mediated, are really somato-somatic in nature. Inasmuch as it is now well established that sweat glands and cutaneous blood vessels receive their innervation from sympathetic neurons that are separate and distinct from those that innervate various internal organs, the results of such studies simply cannot be used to imply associated or concomitant changes in the activity of sympathetic neurons whose axons innervate these organs. Additionally, although a host of autonomic reactions to somatic pain have now been described in quite some detail [31, 32], their regional and/or segmental specificities with respect to internal organs are not always so clear cut. For example, increases in heart rate are no more likely to occur in response to noxious stimuli applied to somatic structures of the upper back, chest wall or hand than they are in response to stimuli of like intensity applied to the foot. We will begin our discussion by reminding the reader that it is not by mere coincidence that fragile visceral organs benefit greatly from the fact that they are encased in a tough somatic shell that protects them from a host of potentially damaging environmental influences. Therefore, it does not seem particularly logical that such a system would easily allow, much less conspire to facilitate, sequences of events designed to initiate the rather premature demise of various internal organs in response to relatively modest somatic insult (e.g., the chiropractic subluxation or the osteopathic lesion). Furthermore, one would certainly expect that, if these sorts of segmental or regionally related "somato-visceral disease" mechanisms were actually operative in a significant proportion of patients, then at least a few modest correlational implications for their existence would have been revealed in the biomedical literature by now. As yet, however, there is not the slightest suggestion that patients suffering from severe, primary, mechanical low back pain, for instance, are more prone to develop higher incidences of prostate or testicular carcinoma, colitis, ovarian cysts, endometriosis, pancreatitis, appendicitis, diabetes mellitus or any other category of regionally or segmentally related organ disease. Indeed, in and of itself, the rather conspicuous absence of even one such obvious epidemiological somato-visceral disease correlate seems to cast serious doubt as to the existence of a clinically significant regionally or segmentally related "somato-visceral disease" mechanism. Moreover, it makes little sense to us that mechanisms designed for the successful adaptation of the organism to various emergency situations would be coupled with effects that would put certain tissues at risk of sympathetically mediated ischemic necrosis. For instance, the existence of such responses would strongly imply that certain organ tissues (skin, gut) would be forced to undergo significant ischemic compromise in situations involving fight or flight. Moreover, given that these same autonomic mechanisms are known to be operative in simple exercise (inasmuch as exercise represents the most important common denominator of all fight or flight emergency situations), extension of such thinking would seem to contradict the rather prevalent view that regular exercise represents a healthy form of activity, if the adaptive (i.e., maladaptive) autonomic responses to exercise were to include, for instance, the concomitant ischemic sacrifice of even only a few thousand gastric mucosal cells. Indeed, current concepts regarding the physiology (and pathophysiology) of the autonomic nervous system do not support the notion that even a sustained, maximal sympathetic activity involving various organs and tissues would create ischemic resposes of any real constquence. Nor have experiments carried out in the attempt to test this hypothesis directly been able to demonstrate that the sympathetic nervous system is even capable of doing so [33–47]. This is not altogether surprising, considering that the phylogenetic development of organ cells, along with an impressive array of sophisticated local-tissue regulatory mechanisms designed to insure adequate delivery of oxygen and nutrients, has greatly preceded the evolutionary development of newer neuronal regulatory systems designed for more global (whole-body) fight or flight responses and exercise. For instance, it is now quite well-established that one of the most important roles of the sympathetic nervous system, including its vasomotor component, is to help orchestrate a sequence of global changes that result in increase in cardiac output, as demanded not only by fight or flight emergency situations, but also by general exercise [48–51]. Unfortunately for many students of the allied health sciences, introductory-level exposure to the various mechanisms operative in such situations may often allow for the misleading impression that the sympathetic vasomotor system serves the purpose of significantly reducing blood flow to "less important" tissues (skin, gut), thus "shunting" blood to "more important" ones (skeletal muscle, brain, heart). As pointed out earlier, such a maladaptive mechanism would most likely prove disastrous for cells of the cutaneous and splanchnic vasculature, even if its effects were operative for only a few minutes. Nevertheless, despite the occasional educational misrepresentation, it is now well-recognized by those specializing in the area of cardiovascular physiology that the sympathetic vaso-constrictor system is not designed to cut off blood flow to any tissue, but rather to facilitate the rapid transfer of isosmotic fluid (stored primarily in the interstitial spaces of skin and gut) to the vasculature [48 –51]. In brief, it is now understood that the sympathetically mediated increases in arteriolar resistance that occur in these tissues mainly serve the purpose of effecting a drop in intraluminal capillary pressure. The resulting hydrostatic pressure disequilibrium then causes significant amounts of stored isosmotic interstitial fluid to move into the capillaries, thereby effecting a rapid expansion of venous volume, venous return, right atrial filling pressure and, therefore, cardiac output (i.e., Starling's Law). These sympathetically mediated increases in vascular volume, when viewed in isolation, actually represent a far more important mechanism affecting overall increases in cardiac output than are the associated sympathetically induced increases in heart rate and myocardial contractility [48–51]. Furthermore, such changes in cardiac output represent increases in the amount of oxygenated blood delivered per minute to all tissues of the body, not merely to skeletal muscle, heart and brain. As pointed out earlier, tissues that might theoretically be susceptible to some putative sympathetically mediated "vaso-constrictor attack" are, in fact, armed with an elegant and extremely powerful array of local protective autoregulatory back-up mechanisms designed to insure adequate delivery of oxygen and nutrients, even in the face of intense, sustained sympathetic stimulation [33–47]. The most immediate and obvious of these mechanisms simply involves the narrowing of interstitial spaces which occurs because of the transfer of interstitial fluid into capillary lumina along the hydrostatic pressure gradient brought about by arteriolar constriction responses. The resulting decrease in capillary-cell diffusion distance, which facilitates compensatory oxygen delivery from capillaries to tissues, thus provides a first line of defense against potential ischemia [50, 51]. If, for some reason, tissue cells were still to become even only slightly oxygen deprived, biochemical shifts involved in enhanced anaerobic glycolysis quickly result in the cellular liberation of CO2 and lactic acid. Diffusion of these molecules from tissue cells to capillary lumina is responsible for significant local decreases in the affinity of hemoglobin for oxygen (i.e., Bohr shift effects), thus all, owing for enhanced free oxygen disassociation and delivery - to tissue cells and therefore providing for yet a second obstacle to potential ischemia [48–51]. These molecules, as well as a number of additional chemical mediators that have similar effects on hemoglobin O2 affinity (e.g., histamine, prostaglandins, kinins, etc. ), are released by a number of interstitial cellular elements in response to even slight decreases in blood flow . In addition to their celebrated Bohr-shift actions, these same chemical mediators are also capable of exerting powerful relaxation effects on arteriolar smooth muscle, thereby even more directly overriding sympathetically mediated vasoconstriction responses . If this were not sufficient, yet a third line of defense concerns intrinsic mechanisms inherent to arteriolar tissue itself. The first of these involves a shift from alpha-mediated vaso-constriction responses to beta-mediated vasodilatory ones. In brief, the membranes of arteriolar smooth muscle cells contain a relatively low number of high-affinity alpha-noradrenergic receptors that initially mediate smooth muscle contraction. However, with prolonged norepinephrine release, binding to lower affinity but much more numerous (i.e. high-capacity) beta receptors quickly takes precedence. Consequently, in response to sustained increases in the activity of sympathetic nerves, alpha-mediated vasoconstriction responses can be maintained for only a short time period before being overridden by beta-mediated vasodilatory ones [48–52]. Additionally, down-regulatory properties inherent to arteriolar endothelium also include other intracellular biochemical mechanisms that are even more powerful. For example, even when beta-mediated vasodilatory responses have been blocked pharmacologically, relaxation of smooth muscle still occurs quite quickly and independently in the face of intense noradrenergic stimulation [53–55]. With respect to down-regulatory mechanisms inherent to the nervous system itself, sympathetic nerves themselves do not have the capacity for the indefinite release of norepinephrine. Indeed, in response to continuous maximum stimulation, noradrenergic nerve terminals contain enough stored norepinephrine to sustain neurotransmitter release for only a few minutes before terminal depletion occurs [56, 57]. Last but not least, even if blood flow were to become significantly compromised for some reason, the extent to which this would lead to frank tissue disease would still be at issue. For instance, splanchnic tissues are capable of withstanding major reductions in blood flow for prolonged periods of time without incurring any ischemic injury, provided that diminished flow is not accompanied by decreased blood oxygen-carrying capacity . In summary then, internal organs are armed with an elegant and powerful array of highly efficient, cellularly mediated, autoregulatory back-up mechanisms designed to provide for adequate oxygen and nutrient delivery to their tissues, even in the face of the extreme, sustained increases in sympathetic activity that often occur in response to wide fluctuations in overall whole-body activity. Therefore, considering the nature and preemptive importance of these local tissue factors, together with a more sophisticated understanding of the various roles played by the sympathetic nervous system, it is not particularly surprising that experiments involving the stimulation of sympathetic nerves have failed to demonstrate that the sympathetic nervous system is even capable of creating significant ischemia or any other potentially damaging influence in any of the tissues it innervates [33–47]. Unfortunately, the apparent inability of sympathetic nerves to induce meaningful tissue ischemia has not always been fully appreciated by many within the biomedical community. For instance, one of the last bastions of support for the notion of sympathetically induced tissue ischemia, although somato-somatic in nature, has stemmed from clinical observations concerning the condition commonly referred to as "reflex sympathetic dystrophy". In this syndrome, which is characterized by severe burning pain exhibited primarily in the extremities, the surgical resection of sympathetic nerves supplying the area of complaint or local injections of noradrenergic receptor antagonists occasionally provide striking (although often only transient) amelioration of symptoms. This has led to the premature assumption that afferent nociceptive signals generated from injured or inflamed somatic tissues must somehow set into play regionally specific, sympathetic vasoconstrictor reflex responses that function (as if part of a vicious cycle) to actually exacerbate the degree of tissue damage. The occasional symptomatic relief observed following therapeutic inhibition of the sympathetic nervous system was therefore presumed to be attributable to interruption of this aggravating ischemia-producing neuronal component, thereby effecting a restoration of blood flow to the injured area and allowing the processes of healing and repair to proceed in a less compromised fashion. Over the last few years, however, the presumption of sympathetically mediated tissue necrosis thought to be operative in such clinical conditions has been seriously challenged [59–61]. In brief, the balance of evidence to date suggests that the role the sympathetic nervous system does play in its response to tissue injury involves mainly the noradrenergic sensitization of nociceptors located within the damaged tissue, an effect that often results in significantly amplified pain perceptions [32, 62, 63]. Therefore, in keeping with its other adaptive roles in emergency situations, it seems far more likely that this pain-accentuating role of the sympathetic nervous system is primarily related to learning reinforcement and the protection of injured tissue, rather than some evolutionary maladaptation capable of actually exacerbating tissue damage. In other words, this sympathetically mediated response to primary tissue damage probably serves the purpose of alerting the cerebral cortex to injury, thus inducing behavior consistent with tissue repair and healing (e.g., trauma avoidance). On the other hand, the persistent nature of these syndromes and their occasional resistance to normal processes of healing and repair are now thought to be the result of the pathophysiological disruption of local autoregulatory tissue mechanisms brought about by the original injury or may simply be due to factors associated with disuse (i.e., pain avoidance), the effects of which may include various alterations in blood flow and connective tissue integrity known to be the consequence of chronic limb immobilization . It seems, then, that the foundation upon which the concept of regional or segmentally related "somato-visceral disease" has been based rests on very shaky ground indeed. Although there is certainly no question that somatic pain has the propensity to elicit a number of global and/or regionally related somato-visceral reflex responses, the collective scientific evidence to date (along with a bit of common sense) provides little support, if any, for the notion that these autonomic responses are capable of initiating processes of frank tissue disease . In brief, the collective results obtained by these studies demonstrate that somatic pain, together with the autonomic reflex responses that it induces, is notorious in its ability to create complex patterns of signs and symptoms that can often be virtually identical to and, therefore, easily mistaken for those induced by primary visceral disease. 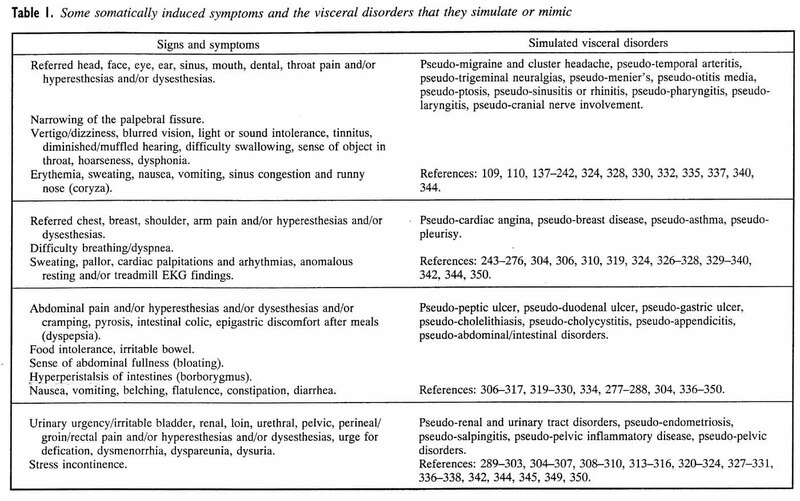 Unfortunately, these well-documented, "pseudo" or "simulated" visceral disease syndromes can often be responsible for a significant number of medical misdiagnoses. Furthermore, it is not unreasonable to suspect that the existence of these somatic visceral disease mimicry syndromes could also account for the apparent miraculous "cures" of presumed visceral disease that have been observed over the years in response to various somatic therapies. The first demonstration of the phenomenon of somatically induced visceral disease simulation was revealed in experiments performed by Kellgren and Lewis in 1938 [65–69]. By injecting hypertonic saline into deep somatic paraspinal structures, these investigators were able to produce diffuse, regionally related pain referral patterns that were virtually identical to those already known to be characteristic of a number of primary internal organ diseases. Additionally, the noxious stimulation of these somatic tissues often elicited a variety of associated somatic and autonomic reflex responses (e.g., increases in heart rate, blood pressure, reflex muscle spasm, cutaneous hyperalgesia, etc.) that were also often found to be indistinguishable from those typically associated with various primary visceral disorders. The repetition and extension of Kellgren's work by several other teams of investigators [70–87], together with tremendous advances in knowledge concerning the anatomy and physiology of nociception in general, have made the basic mechanisms responsible for the phenomenon of organ disease mimicry increasingly clear. [88–108] In brief, it is now well-established that phylogenetically primitive visceral afferent nerves that transmit nociceptive information from internal organs, and equally primitive somatic afferents involved in the transmission of nociceptive information from deep connective tissue structures (e.g., muscle, fascia, tendons, ligaments, joint capsules, bone etc.) converge on common pools of interneurons within the spinal cord and brainstem (see Figure 4). identical to those typically associated with primary dysfunction involving various internal organs. Schematic depiction of the basic neurological mechanism by which dysfunction confined to purely somatic structures is capable of producing signs and symptoms that are identical to those typically associated with primary dysfunction involving various internal organs. It is now well-established that afferent fibers that transmit nociceptive information from deep somatic structures converge on the same central neuronal pools as do the independent afferent fibers that transmit noxious stimuli from regionally-related visceral structures. Unfortunately for the diagnostician, the subsequent relaying of either of these two sources of afferent information by this convergent pool of neurons into other common central pathways can often result in overt patterns of signs and symptoms that may be virtually indistinguishable with respect to their somatic vs. visceral etiologies. As discussed earlier, the theory that somatic dysfunction is capable of actually causing true visceral disease (See Figure 3) is one for which scientific evidence is seriously lacking. On the other hand, the fact that somatic dysfunction can often mimic, or simulate, the symptoms of visceral disease (and therefore may be easily mistaken for it), is supported by an impressive amount of both experimental and clinical scientific data [65–350]. Cutaneous or deep somatic hyperalgesia and/or allodynia perceived at the site of stimulation. Visceral, deep somatic or cutaneous hyperalgesia and/or allodynia perceived at sites distant to the site of stimulation. Reflex-induced muscle spasm, weakness or more subtle change in muscle tone. Manifestations of altered parasympathetic and/or sympathetic activity. Alterations in the secretory activities of various endocrine organs. It is certainly not the purpose of this review to discuss in detail the 285 scientific articles we have managed to gather that deal with various somatic visceral disease mimicry syndromes; rather, it is to simply introduce the reader to the impressive body of both basic and clinical scientific literature that collectively and convincingly establishes their existence. For instance, depicted in Figure 5 is an illustrated synopsis of some of the segmentally related pain referral patterns (observed over the years by several independent investigators) following the experimental injection of noxious substances into various deep, paraspinal, myofacial and/or connective tissue structures. Additionally, for the reader's convenience, we have included (along with pertinent literature references) a list of well-documented, regionally related signs and symptoms that can often be the result of primary somatic dysfunction, together with the rather impressive collection of primary visceral conditions that these patterns of signs and symptoms have been show to mimic or simulate (see Table 1). In retrospect, the patient exhibiting deep chest and arm pain, together with associated pallor, sweating, dyspnea, cardiac dysrhythmia, and mid- or upper thoracic muscle spasm may actually be suffering from true primary myocardial ischemia (coronary artery disease). On the other hand, because somatic pain fibers from various deep connective tissue structures of the mid- to upper thoracic and lower cervical spine converge on the same dorsal horn neurons as do visceral afferents from internal organs in the same region of the body (including the myocardium), it can quite often be the case that these identical signs and symptoms are attributable, instead, to dysfunctional factors confined solely to regionally related, deep paraspinal somatic structures. As might be expected in the latter situation, the administration of nitrates or beta-blockers are consistently found to be ineffective, whereas therapies directed at somatic structures of the lower cervical or mid- to upper thoracic spine (e.g., spinal manipulation) are often found to produce a rather astonishing and immediate relief of symptoms. Indeed, it has been estimated by some investigators that this sort of somatic mimicry may account for up to 10% of patients initially assumed to be suffering from true cardiac angina . Estimates regarding the proportions of patients harboring other categories of somatic visceral disease simulation are thought, in many cases, to be much higher. Given that the diagnosis of primary organ disease has more often than not been made almost solely on the basis of overt symptomology alone, it is not surprising that a significant number of such patients, frustrated with failed medical treatments, as well as the inability of their medical doctor(s) to "find out what's wrong with them", have eventually sought the assistance of the "alternative" health care practitioner. Given the circumstances, it would not be altogether unreasonable to expect that any significant amelioration of symptoms, following the successful application of one or more of a variety of somatic interventions, might be interpreted by both the patient and the practitioner as having "cured" the primary organ disease in question. Furthermore, it is also easy to imagine that, historically, these sorts of medical "failures" (i.e., patients who had been subjected to one or more misdiagnoses and ineffective medical treatments) could have accounted for a significant number of individuals seeking "alternative" health care, thus tending to keep the notion of "somato-visceral disease" alive and well within a number of clinical disciplines, including chiropractic. From the point of view of the medical practitioner, there would have been perfectly understandable reasons (particularly in lieu of sensitive and precise "gold-standard" tests for the presence of true visceral disease) to assume the worst on behalf of these types of patients, given the likely prospect that errors of medical treatment omission could very well result in significant morbidity and/or mortality on the part of patients actually harboring true primary organ disease. To make matters even worse for the diagnostician (and of course the patient), the somatically induced facilitation of central neurons has also been shown to create situations in which normally innocuous visceral afferent signals converging on these same neuronal pools may be perceived as highly unpleasant, thereby further increasing the likelihood of a visceral misdiagnosis. For example, normal degrees of stretch induced by the mere presence of food in the G.I. tract may occasionally become rather noxious in somatic simulation syndromes, thus making the diagnosis (i.e., the misdiagnosis) of true gastrointestinal disease even more compelling to both physician and patient. Fortunately, with more recent advances in the development and utilization of far more precise and specific diagnostic tests for the presence of true primary visceral disease, it has become increasingly possible to clearly distinguish somatic from visceral etiologies. For instance, among cardiologists, coronary angiography is now considered to represent the only acceptable method for clearly distinguishing the presence of true cardiac angina from other disorders (including somatic ones) that are known to mimic it. Even aberrant ECG patterns, once thought to be part of the primary events associated with cardiac angina, are now known to be reflexogenic and secondary (again because of common convergent pathways) to a host of somatic and other visceral conditions and are therefore no longer considered to be diagnostic for the presence of true coronary artery disease. Similarly, exercise "stress tests" may also bring about symptoms characteristic of true cardiac angina in patients actually suffering from somatic simulation, merely because the test often aggravates the somatic condition and not because of the increase in myocardial oxygen demand. Furthermore, as the concept of somatic vs. visceral afferent convergence implies, it can also be the case that nociceptive input from dysfunctional somatic structures may act to exacerbate the symptoms of pre-existing visceral disease. Although this might very well provide ample justification for the role of the somatic therapist in the comanagement of the patient's overall symptoms, it is highly important that any significant amelioration of symptoms in these circumstances not be interpreted as representing resolution of the actual visceral disease process itself or that the patient, upon experiencing significant symptomatic relief, be allowed to discontinue important medical treatments that might serve to put them at serious risk or worsen their prognosis for recovery. We fully expect that there are some who will remain unconvinced that the apparent manipulation-induced "cures" of true visceral disease observed over the years have most likely been the result of the effective management of a variety of somatic mimicry syndromes (the possibility of natural histories of remission not withstanding). For instance, it has been recently suggested by Leach  that we have categorically dismissed the possibility of a regionally or segmentally related "soma to-visceral disease" mechanism. Quite to the contrary; however, given the preponderance of evidence to date, we simply assert that we have been able to find no scientifically sound reason to believe it to be so, while at the same time being confronted by a plethora of compelling scientific reasons to believe it not to be. On the other hand, for those who might continue to seriously pursue the question of whether manipulative therapy might indeed represent an appropriate means for treating true primary visceral disease, a word of caution is in order. In addition to the employment of appropriate control groups for natural remission, placebo effects, etc., such clinical trial studies must also include careful, state-of-the-art, diagnostic pre-screening of study populations to exclude (or at least account for) those patients who might be harboring somatic simulation syndromes, rather than the true visceral disease under investigation. Additionally, these same specific diagnostic tests must also be used as outcome measures in the manipulative trial itself. Failure to properly distinguish those patients suffering from true visceral disease from those patients whose symptoms may be merely mimicking it could otherwise yield highly misleading results: namely, the possible generation of a statistically significant effect with respect to an entire patient population due solely to its contamination by patients not actually suffering from the true visceral disease in question, but instead harboring somatic dysfunction for which the therapy (e.g., spinal manipulation) might indeed be expected to be effective. Needless to say, the same considerations apply in all situations in which the effectiveness of any form of therapy is being investigated. For example, considering the recent demonstration that up to 10% of patients exhibiting symptoms typical of cardiac angina are instead found to be suffering from somatic simulation, one might ponder just how often over the years the failure of scientists and clinicians to recognize the existence of these various somatic mimicry syndromes has led to erroneous interpretations following clinical studies that have attempted, for example, to investigate the effects of various medical treatments for true coronary artery disease. At present we are aware of not a single appropriately controlled study that would persuade us to conclude that primary dysfunction involving various somatic structures of the spinal column or elsewhere has the ability, much less the propensity, to cause regionally or segmentally related visceral (internal organ) disease. Nor does there seem to be any clinical evidence, even of a purely correlative nature, that would support the notion of a regional or segmentally induced "somato-visceral disease" connection. Indeed, it does not make much sense that mechanisms would have developed that would easily allow, much less initiate, sequences of events leading to the premature demise of various regionally or segmentally related internal organs, even in response to relatively severe somatic insult. Furthermore, current knowledge regarding the function of the autonomic nervous system also fails to support the existence of a plausible biological mechanism that could account for such a "somato–visceral disease" relationship. Simply put, the autonomic nervous system just does not seem to be capable of inducing frank tissue disease in any of the organs it innervates, regardless of the state of its relative activity. On the other hand, there is simply no doubt that afferent nociceptive signals generated from dysfunctional deep somatic structures can often result in referred pain patterns, along with a number of equally misleading autonomic reflex responses, that have been shown to simulate (rather than cause) true visceral disease because of their convergence on the same pools of central nervous system neurons that also receive afferent input from regionally related internal organs. The existence of these somatic visceral disease mimicry syndromes obviously justifies a highly important mandate for increased cooperation between the medical physician and those who specialize in the evaluation and treatment of various aspects of primary somatic dysfunction. Fortunately, there is a steadily growing understanding and appreciation of this clinical phenomenon across many health care specialties. On the other hand, in the course of developing this review, we have found access to literature specifically relevant to the concept of somatic visceral disease simulation to be extremely difficult and time consuming, due in large part to the variability of key indexing words selected by investigators operating within a wide diversity of biomedical disciplines (e.g., cardiology, obstetrics and gynecology, gastroenterology, ophthalmology, manual medicine, orthopedics, neurology, etc.). but rather, to provide a modest obstacle to everlasting error. The authors express their appreciation to Seva Craven, Gigi Chu, Jane Locquiao and Juan Andrade for their assistance in the preparation of this manuscript, and to Robert Cooperstein, D.C., for his editorial suggestions.